For someone like me that grew up in the wilds of northern New York State, I’m always happy to meet a fellow transplant. Officer Costello, the newest recruit to the Virginia-Highland Security Patrol, grew up in Sayreville, NJ. For those in the know, that’s exit 11 on the New Jersey Turnpike and about thirty minutes south of Manhattan. In addition to earning a Bachelor of Arts degree from John Jay College in NYC in 2010, he has just been admitted into the Georgia State College of Law and will earn his Juris Doctor degree in 2020. 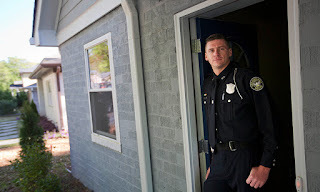 After earning his undergraduate degree, and before moving south Officer Costello worked for a security management company, but Atlanta was calling. He joined Atlanta Police Department in 2011 working first in patrol in Zone 4 and then moving to the Street Crimes/APEX Bravo Unit. This is a team of officers assembled to address violent crime issues city-wide. APEX stands for Atlanta Proactive Enforcement Interdiction and is just one of the teams that make up Special Enforcement including Narcotics Enforcement, Gang Squad and Homeland Security. Getting to meet new people and interact with community members is Michael Costello’s favorite thing about being a police officer, so don’t be surprised if you see him and his three-year-old son around Zone 6 when he isn’t working too. Through the Atlanta Police Foundation’s Secure Neighborhood initiative, he recently purchased a home in the Edgewood community. This program is designed to have Atlanta police officers move back into the city, and act as a liaison between the department and their fellow community members. When asked for a safety tip he reminds us to always be aware of our surroundings. We will try to do that Officer Costello, and until he earns that law degree and possibly a new career, please make him welcome in Virginia-Highland. Let him know how much we appreciate what he does to keep us all safe.